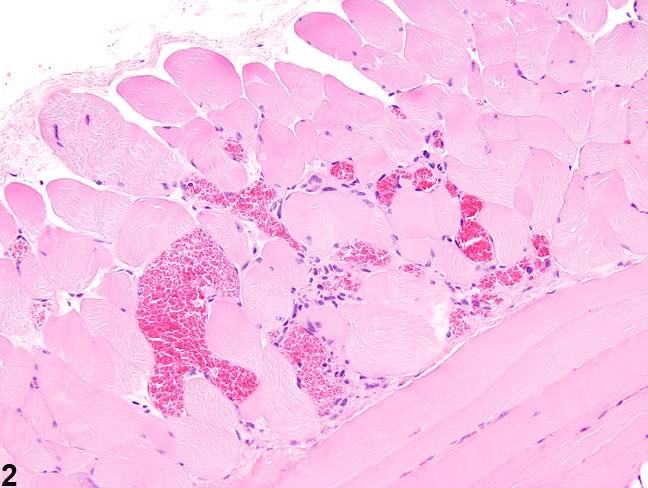 Skeletal muscle - Angiectasis in a male B6C3F1/N mouse from a chronic study. Note the dilated endothelial-lined vessels filled with blood. Skeletal muscle - Angiectasis in a male B6C3F1/N mouse from a chronic study (higher magnification of Figure 1). There are dilated endothelial-lined vessels filled with blood. Angiectasis is a nonproliferative lesion in which preexisting vascular spaces are dilated and prominent ( Figure 1 and Figure 2 ). The vessels are lined by a single layer of flat endothelium in which the endothelial cells are normal in appearance, number, and size. Angiectasis is typically an incidental lesion, and its etiology and pathogenesis are often obscure. It is important to distinguish angiectasis from a hemangioma. This can be difficult because the distinction is not always obvious and angiectatic lesions can appear in regions of hemangiomas. Hemangiomas tend to be well-circumscribed, unencapsulated masses composed of tightly packed, dilated vascular spaces that compress surrounding tissues. While the vascular spaces are lined by a single layer of well-differentiated endothelium, endothelial nuclei are typically increased in number and slightly enlarged. 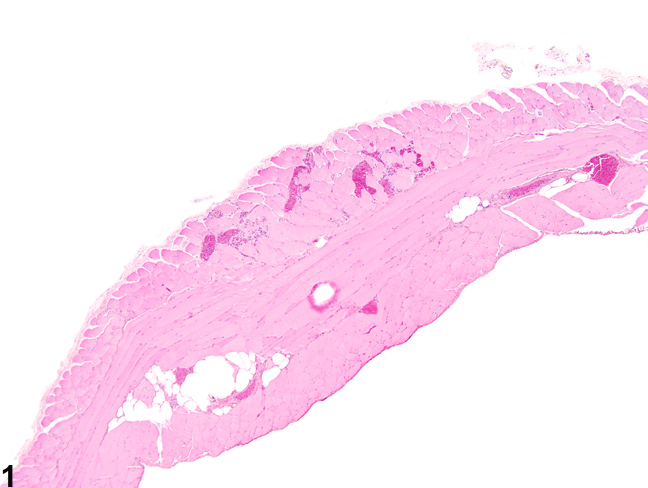 In general, the absence of endothelial cell proliferation and/or nuclear atypia differentiates angiectasis from a neoplastic vascular lesion. In addition, angiectasis does not typically present as a well-circumscribed mass; the dilated vascular channels often course irregularly through the tissue. When present, angiectasis should be diagnosed and assigned a severity grade. Frith CH, Ward JM. 1988. Cardiovascular system. In: Color Atlas of Neoplastic and Non-neoplastic Lesions in Aging Mice. Elsevier, Amsterdam.